9:1 As soon as all the kings who were beyond the Jordan in the hill country and in the lowland all along the coast of the Great Sea toward Lebanon, the Hittites, the Amorites, the Canaanites, the Perizzites, the Hivites, and the Jebusites, heard of this, 2 they gathered together as one to fight against Joshua and Israel. 1And it came to pass, when all the kings which were on this side Jordan, in the hills, and in the valleys, and in all the coasts of the great sea over against Lebanon, the Hittite, and the Amorite, the Canaanite, the Perizzite, the Hivite, and the Jebusite, heard thereof;2That they gathered themselves together, to fight with Joshua and with Israel, with one accord.3And when the inhabitants of Gibeon heard what Joshua had done unto Jericho and to Ai,4They did work wilily, and went and made as if they had been ambassadors, and took old sacks upon their asses, and wine bottles, old, and rent, and bound up;5And old shoes and clouted upon their feet, and old garments upon them; and all the bread of their provision was dry and mouldy.6And they went to Joshua unto the camp at Gilgal, and said unto him, and to the men of Israel, We be come from a far country: now therefore make ye a league with us.7And the men of Israel said unto the Hivites, Peradventure ye dwell among us; and how shall we make a league with you?8And they said unto Joshua, We are thy servants. And Joshua said unto them, Who are ye? and from whence come ye?9And they said unto him, From a very far country thy servants are come because of the name of the LORD thy God: for we have heard the fame of him, and all that he did in Egypt,10And all that he did to the two kings of the Amorites, that were beyond Jordan, to Sihon king of Heshbon, and to Og king of Bashan, which was at Ashtaroth.11Wherefore our elders and all the inhabitants of our country spake to us, saying, Take victuals with you for the journey, and go to meet them, and say unto them, We are your servants: therefore now make ye a league with us.12This our bread we took hot for our provision out of our houses on the day we came forth to go unto you; but now, behold, it is dry, and it is mouldy:13And these bottles of wine, which we filled, were new; and, behold, they be rent: and these our garments and our shoes are become old by reason of the very long journey.14And the men took of their victuals, and asked not counsel at the mouth of the LORD.15And Joshua made peace with them, and made a league with them, to let them live: and the princes of the congregation sware unto them.16And it came to pass at the end of three days after they had made a league with them, that they heard that they were their neighbours, and that they dwelt among them.17And the children of Israel journeyed, and came unto their cities on the third day. Now their cities were Gibeon, and Chephirah, and Beeroth, and Kirjathjearim.18And the children of Israel smote them not, because the princes of the congregation had sworn unto them by the LORD God of Israel. And all the congregation murmured against the princes.19But all the princes said unto all the congregation, We have sworn unto them by the LORD God of Israel: now therefore we may not touch them.20This we will do to them; we will even let them live, lest wrath be upon us, because of the oath which we sware unto them.21And the princes said unto them, Let them live; but let them be hewers of wood and drawers of water unto all the congregation; as the princes had promised them.22And Joshua called for them, and he spake unto them, saying, Wherefore have ye beguiled us, saying, We are very far from you; when ye dwell among us?23Now therefore ye are cursed, and there shall none of you be freed from being bondmen, and hewers of wood and drawers of water for the house of my God.24And they answered Joshua, and said, Because it was certainly told thy servants, how that the LORD thy God commanded his servant Moses to give you all the land, and to destroy all the inhabitants of the land from before you, therefore we were sore afraid of our lives because of you, and have done this thing.25And now, behold, we are in thine hand: as it seemeth good and right unto thee to do unto us, do.26And so did he unto them, and delivered them out of the hand of the children of Israel, that they slew them not.27And Joshua made them that day hewers of wood and drawers of water for the congregation, and for the altar of the LORD, even unto this day, in the place which he should choose. 28And it came to pass about an eight days after these sayings, he took Peter and John and James, and went up into a mountain to pray.29And as he prayed, the fashion of his countenance was altered, and his raiment was white and glistering.30And, behold, there talked with him two men, which were Moses and Elias:31Who appeared in glory, and spake of his decease which he should accomplish at Jerusalem.32But Peter and they that were with him were heavy with sleep: and when they were awake, they saw his glory, and the two men that stood with him.33And it came to pass, as they departed from him, Peter said unto Jesus, Master, it is good for us to be here: and let us make three tabernacles; one for thee, and one for Moses, and one for Elias: not knowing what he said.34While he thus spake, there came a cloud, and overshadowed them: and they feared as they entered into the cloud.35And there came a voice out of the cloud, saying, This is my beloved Son: hear him.36And when the voice was past, Jesus was found alone. And they kept it close, and told no man in those days any of those things which they had seen. 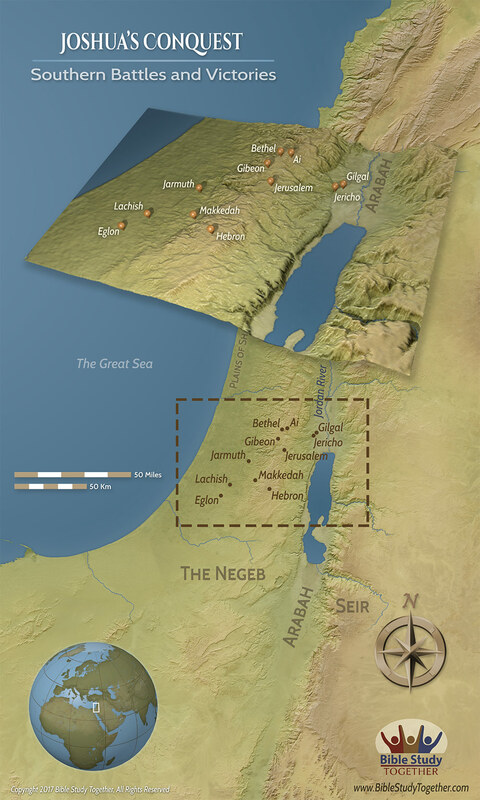 What motivated the Gibeonites to deceive the Israelite leaders? How has lack of prayer caused you to make a bad decision? How did Jesus’ approach to prayer impact His experiences while praying? How did the experience on the mountain help to strengthen Jesus to fulfill His ministry? Pray with someone about a decision they are making.